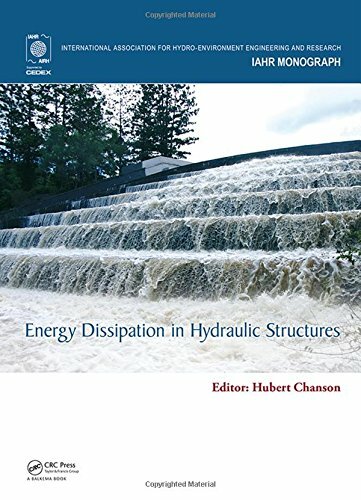 In the reviewer’s opinion, Energy Dissipation in Hydraulic Structures, edited by Hubert Chanson, is recommended reading for hydraulic engineers engaged in the design and maintenance of energy-dissipation devices. With some further polishing, this book could become the gold standard in the subject. This reviewer is left viewing hydraulic structures in a new, more awe-inspired light." Book review by Alistair G.L. Borthwick in 'Engineering and Computational Mechanics' Vol. 170 (March 2017). Recent advances in technology have permitted the construction of large dams, reservoirs and channels. This progress has necessitated the development of new design and construction techniques, particularly with the provision of adequate flood release facilities. Chutes and spillways are designed to spill large water discharges over a hydraulic structure (e.g. dam, weir) without major damage to the structure itself and to its environment. At the hydraulic structure, the flood waters rush as an open channel flow or free-falling jet, and it is essential to dissipate a very signifi cant part of the flow kinetic energy to avoid damage to the hydraulic structure and its surroundings. Energy dissipation may be realised by a wide range of design techniques. A number of modern developments have demonstrated that such energy dissipation may be achieved (a) along the chute, (b) in a downstream energy dissipator, or (c) a combination of both. The magnitude of turbulent energy that must be dissipated in hydraulic structures is enormous even in small rural and urban structures. For a small storm waterway discharging at a 4 m3/s mm high drop, the turbulent kinetic energy flux per unit time is 120 kW! At a large dam, the rate of energy dissipation can exceed tens to hundreds of gigawatts; that is, many times the energy production rate of nuclear power plants. Many engineers have never been exposed to the complexity of energy dissipator designs, to the physical processes taking place and to the structural challenges. Several energy dissipators, spillways and storm waterways failed because of poor engineering design. It is believed that a major issue affecting these failures was the lack of understanding of the basic turbulent dissipation processes and of the interactions between free-surface aeration and flow turbulence. In that context, an authoritative reference book on energy dissipation in hydraulic structures is proposed here. The book contents encompass a range of design techniques including block ramps, stepped spillways, hydraulic jump stilling basins, ski jumps and impact dissipators.